More than one out of every 100 deaths is by suicide. That is more people than die in car accidents [source]. And more than 80 percent of Americans diagnosed with clinical depression are not getting any treatment for it [source]. Studies have shown that one of the key barriers to people seeking treatment is the stigma associated with mental health. My name is Miriam Ament and I am dedicated to breaking the stigma associated with mental health through my organization, No Shame On U. More than a decade ago, I went through a major depression. I faced stigma and isolation from some friends and relatives who didn’t know how to handle me or the situation. When I was at the worst point in my depression, a good friend of mine called. “I only want to talk to you when you’re happy,” she said, “so let’s not talk again for a while.” I never heard from her again. Fortunately, I was able to successfully treat my depression with professional help. Two years ago, through a charity auction, I had the opportunity to go to lunch with legendary actress Glenn Close. She founded a mental health organization and was very open to talking about it. I had never spoken about my history of depression with anyone who was not already aware of it, but I felt compelled to tell Glenn my whole story. She was amazing to talk to and it was so freeing. Shortly after our meeting, I earned a Fellowship from JCC PresenTense Chicago. I launched No Shame On U so that no one should be ashamed to get help in the Jewish community and beyond. My goal is for the people who need the help, to seek it, for family members and friends to know how to provide proper support and for lives to be saved. Last October, I was interviewed by WGN News for a segment they were doing on National Depression Screening Day. For the first time, I talked publicly about my mental health history and, as scared as I was to open up, I knew that my story had the potential to impact an untold number of people. The segment led to a cover story for another Chicago publication, helping further the reach of my story beyond what I ever imagined. No Shame On U is disseminating information daily to raise as much awareness as possible. In addition, we are planning an inaugural event this fall where we hope to reach even more people. If you or someone you know is going through a rough time, please know that you are not alone. If you are in crisis, or know someone who is, please call 24/7 hotline: 1-800-273-(TALK) 8255 OR text 741741 for a 24/7 crisis text line – a live, trained crisis counselor receives the text and responds quickly OR go to www.imalive.org for 24/7 online crisis chat. 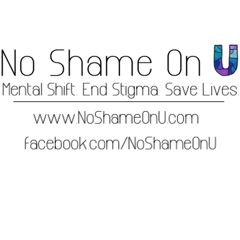 For more information, please go to www.noshameonu.com, Facebook.com/NoShameOnU or @NoShameOnU.